For the second time, this year, a balloon has been stolen again. Previously a Hot Air Balloon was stolen from Lindstrad Balloon factory in March. This time however a balloon has gone from the British School of Ballooning. Please note: On both occasions the relevant owners have no connection with Aerosaurus Balloons Ltd, however we’re just passing on the message to our customers to promote and raise awareness for the relevant companies. 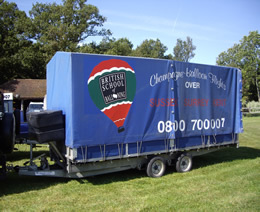 The British School of Ballooning has had a Cream and Burgundy Cameron 210 G-BXJC and 16ft Ifor Williams trailer stolen from Newlands Hall, Chelmsford, Essex over the weekend of 5th and 6th September 2009. It was stored under an open barn near the conference centre at Newlands Hall. The police have been notified of the theft and all local and national newspapers have been advised. We have offered a £1000 reward to the general public for the return of the balloon, please pass this onto everyone you know as we are desperate to get the balloon back. If you have any information or hear of any the equipment being offered please contact The British School of Ballooning on 01428 707 307 A.S.A.P.